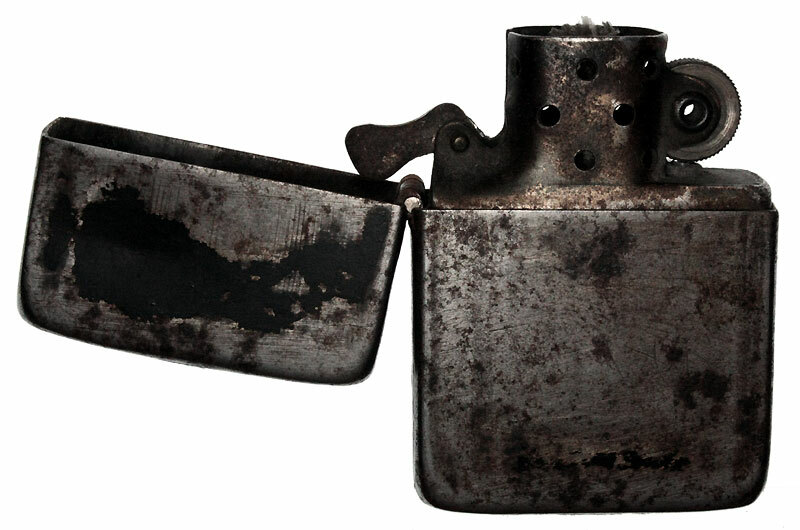 is inseparably connected to World War II. 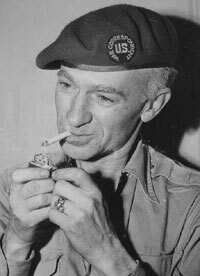 When on Sunday, December 7, 1941 Pearl Haror, Hawaii was attacked by the Japanese, out of a sudden the United States of America were in war. 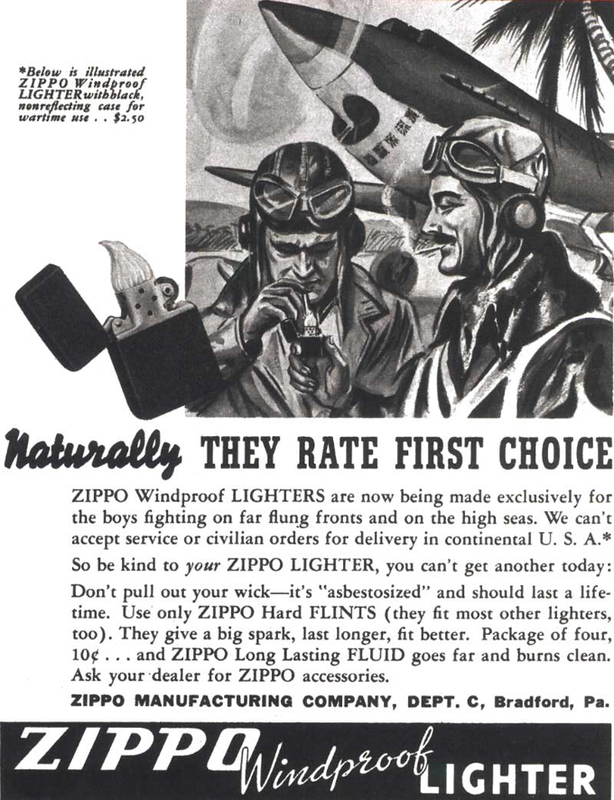 Of course this had economical & operational effects on the nationwide industy too. 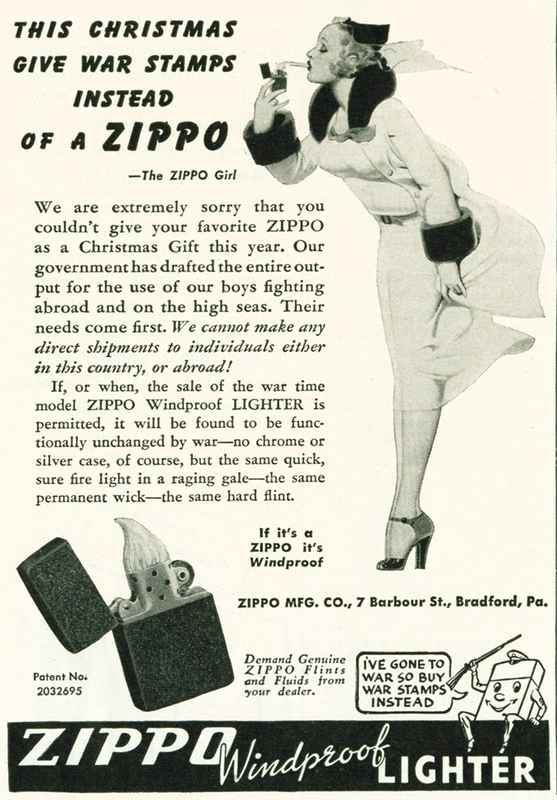 All the grade one steel & brass was needed for the machinery of war & the Zippo Mfg. 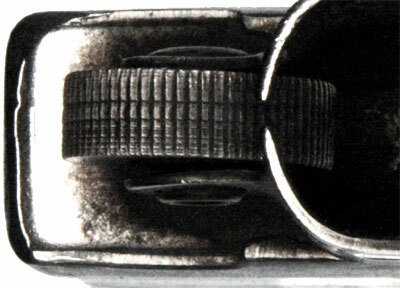 Co. had to use what was available, secondary grade of steel for their production instead. 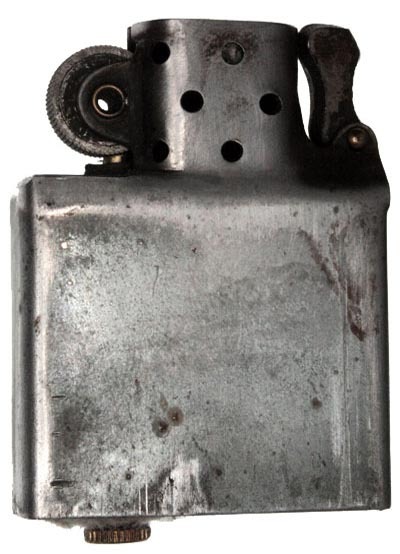 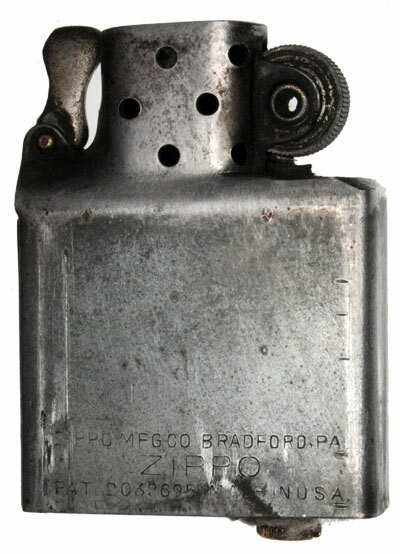 As for chrome or nickel was impossible to use for plating the steel cases, early 1942 Zippo lighters started to corrode from humidity. 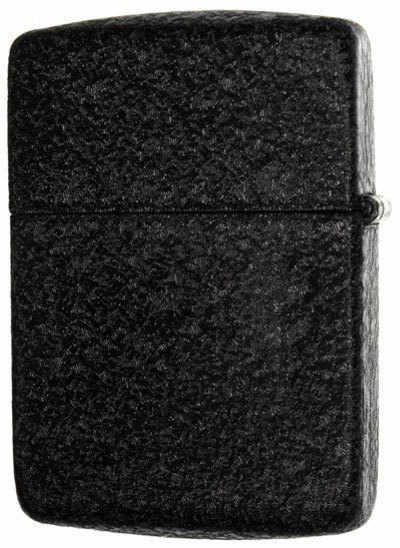 Born out of necessity in order to keep quality standards the cases were coated with a heavy black paint & baked for curing what resulted in a crinkly surface stucture, later on know as black crackle finish. 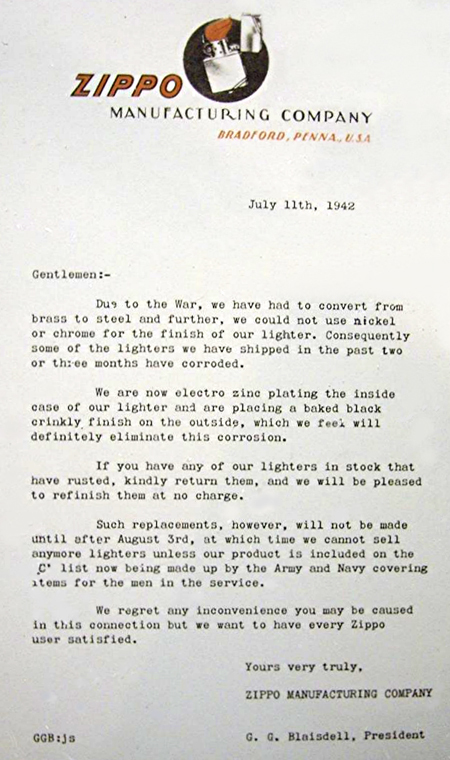 The letter from Mr. Blaisdell was send to retailers nationwide describing the new finish as crinkly. 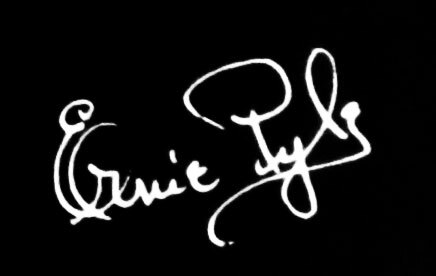 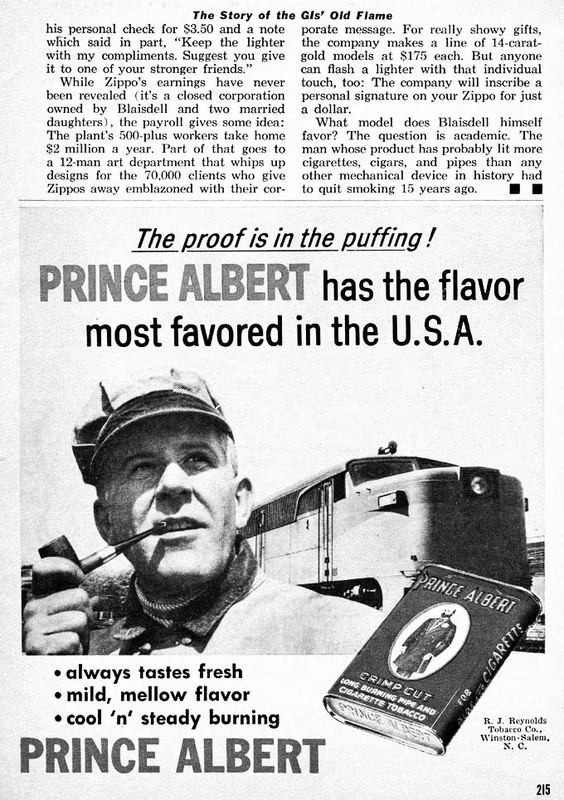 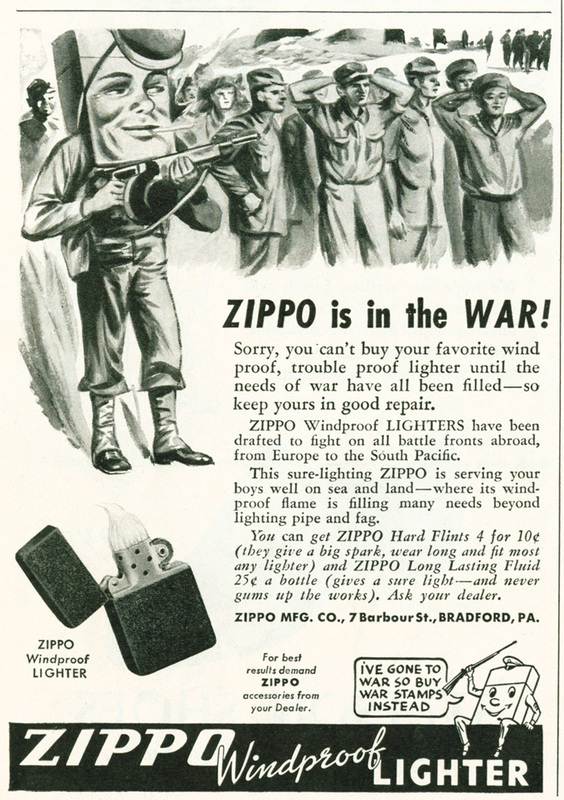 In addition to that the history of the Zippo Manufacturing Company is inseparably connected to Ernie Pyle. 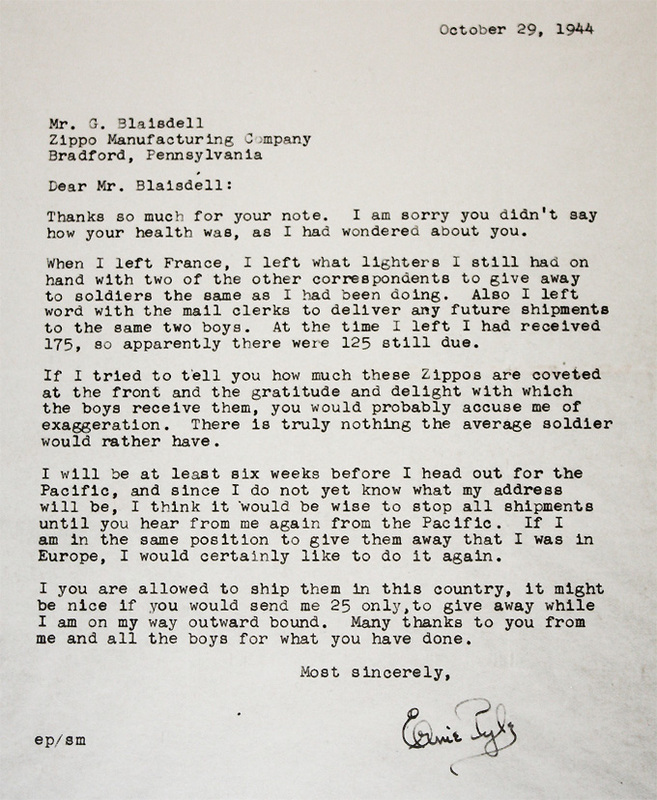 The famous War correspondant wrote columns for the Scipps Howard Newspaper & had the habit of giving a Zippo lighter to every soldier he interviewed, wrote a letter to George G. Blaisdell reporting the G.I. 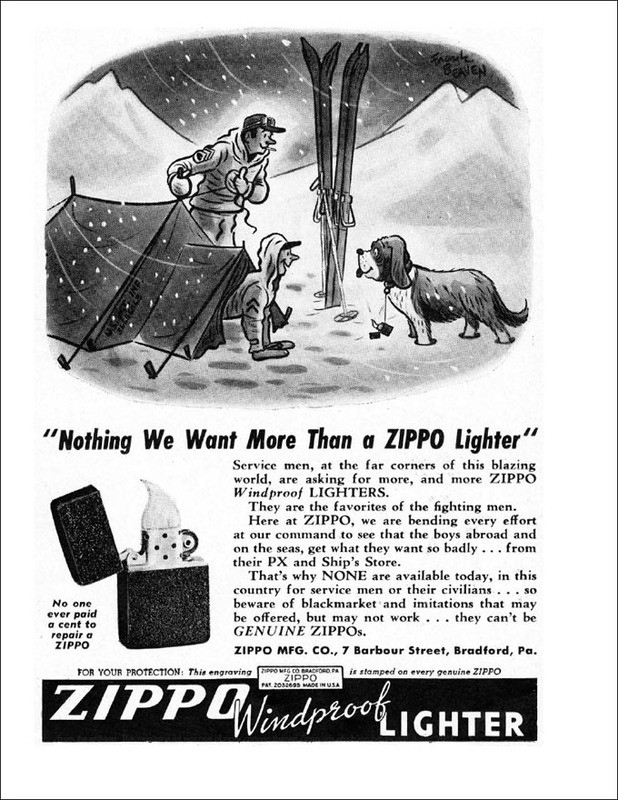 's being very confident having a reliable lighter. 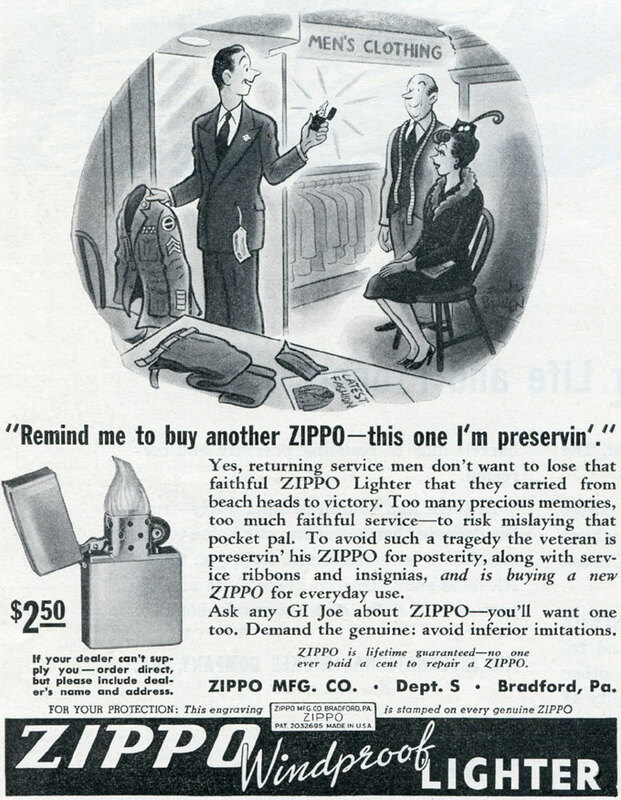 Mr. Blaisdell started sending him about 50 to 100 Zippo lighters a month for free in order to promote his product by Mr. Pyle distributing them by lottery among the G.I.'s. 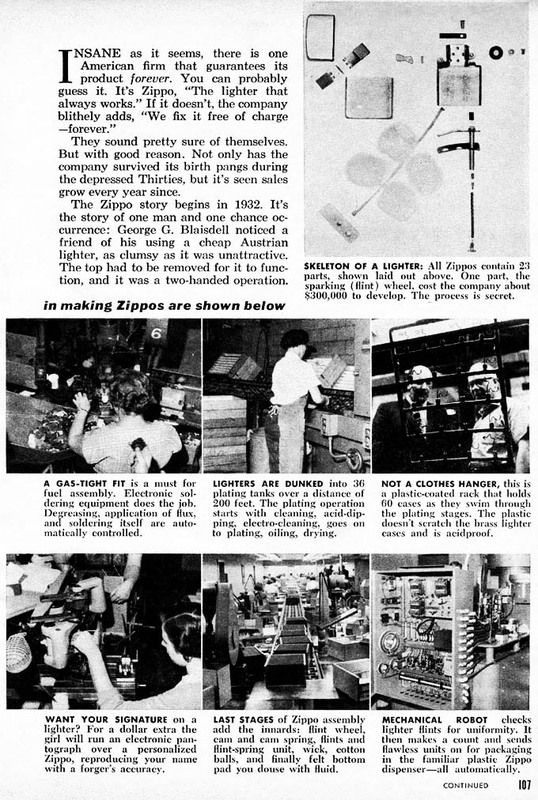 Regarding the company's output the production numbers exploded. 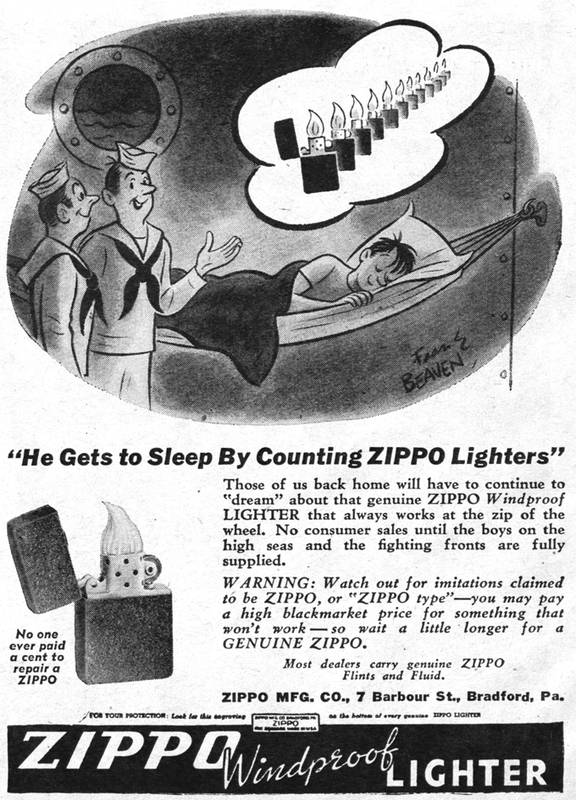 The Army Quatermaster Corps ordered Zippo lighters in 500.000 & 1.000.000 unit lots. 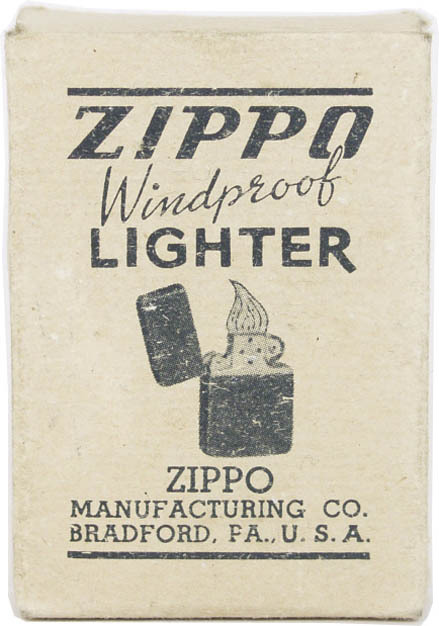 It took 10 years to reach the milestone of 1.000.000 produced Zippo lighters in 1942. 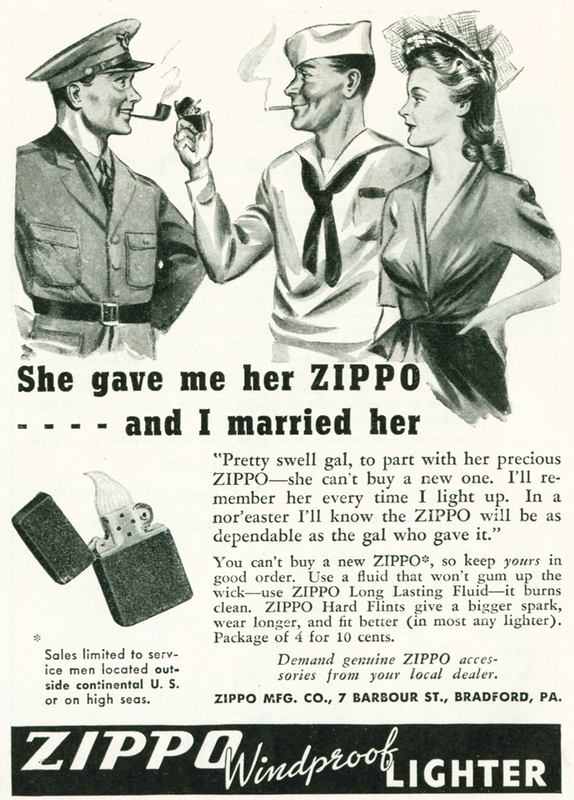 Within the next 5 years this number had multiplied tenfold. 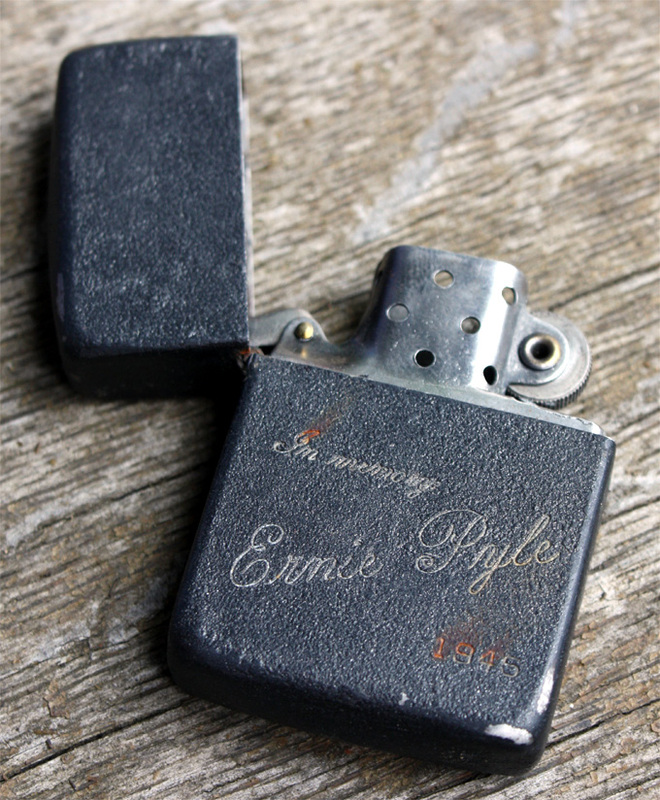 Probably the most valueable pieces among these millions of black crackle Zippo lighters produced from 1942 to 1945 are those made "in memory of Ernie Pyle". 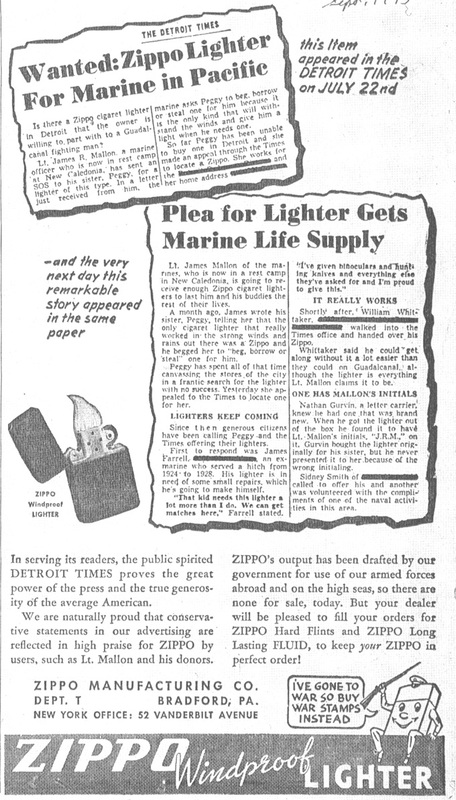 When George G. Blaisdell learned about his friends' dead on April 18, 1945 in the South Pacific he immediately send about 600 specially engraved Zippo lighters to the Captain of the U.S.S. 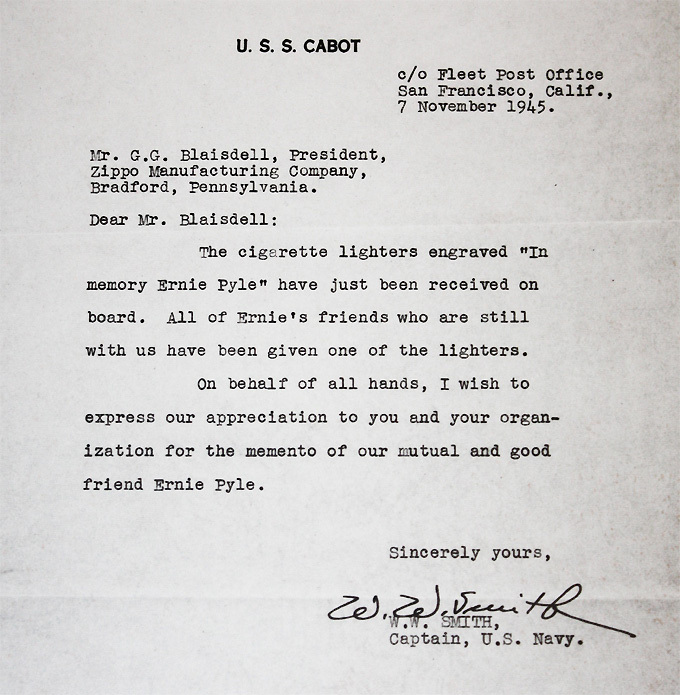 Cabot, the ship Ernie Pyle was on board the last months as give-aways to the crew. 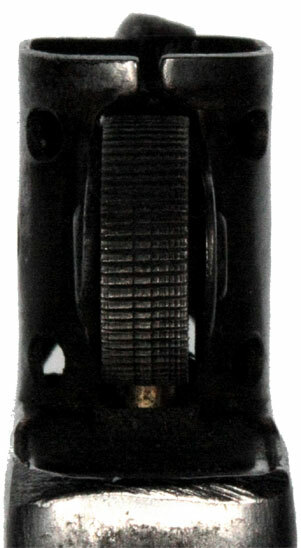 In late 1946 the flint wheel having 70 horizontal teeth was replaced by the newly invented criss-cross style flint wheel now having 48 teeth only. 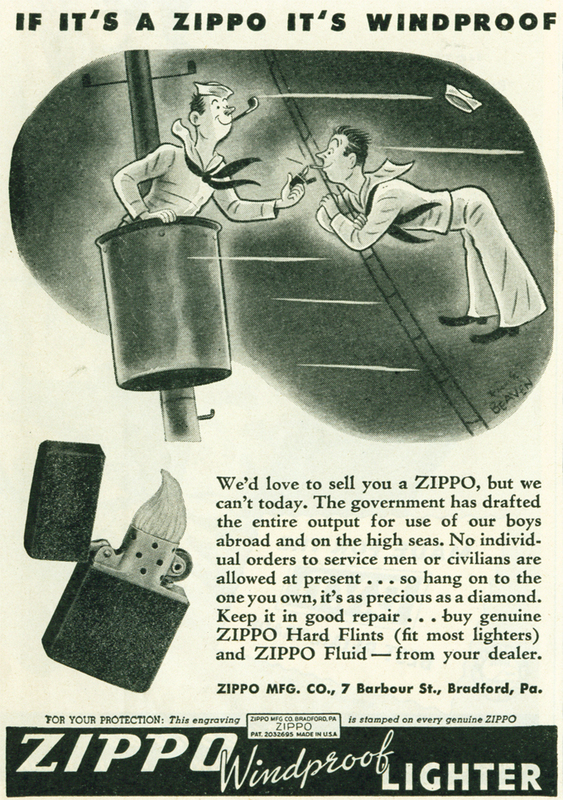 "If a Zippo ever fails to work - we'll fix it free!" 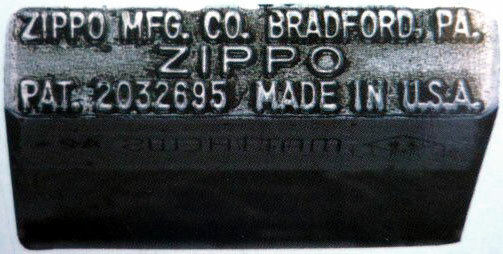 The steel stamping block from Matthews Corporation Pittsburgh, Pa., the leading manufacturer of steel stamps in the U.S.A.
1942 show sligtly bigger ZIPPO characters. 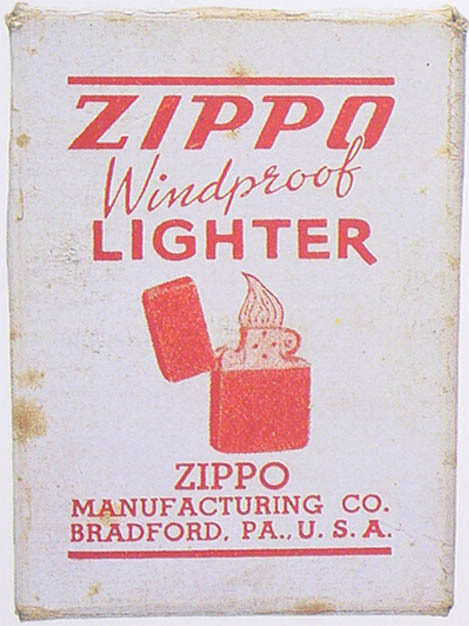 These cardboard boxes were used from 1942 - 1945. 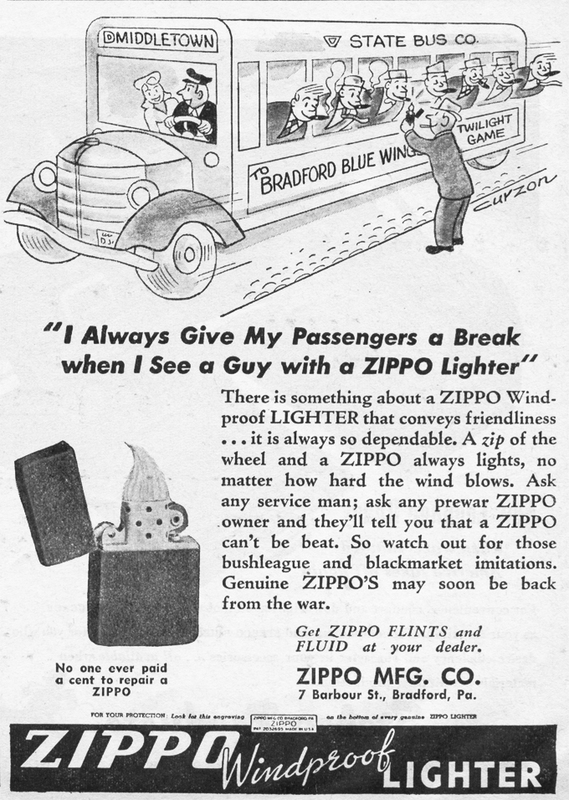 There have also been variations showing the lettering in red or blue instead of black. 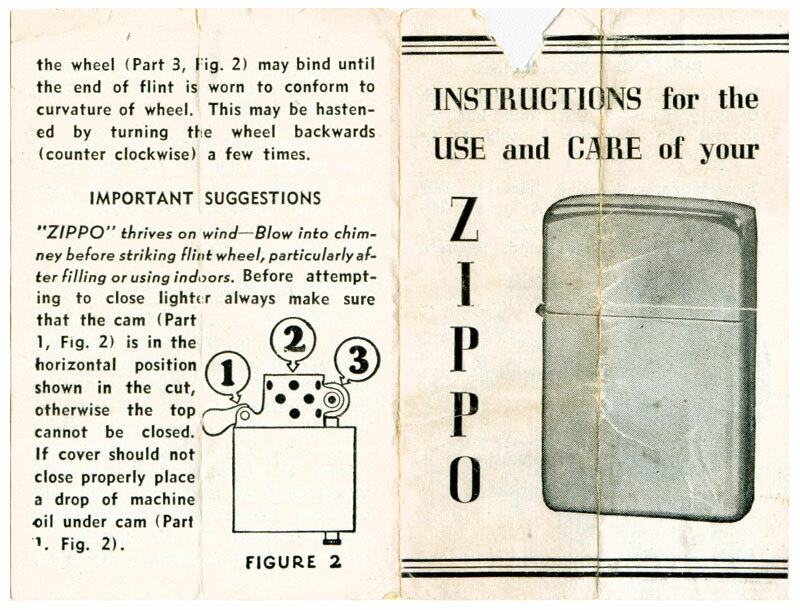 They had no writings on the back but included "Instructions for the use and care of your Zippo" as shown below. 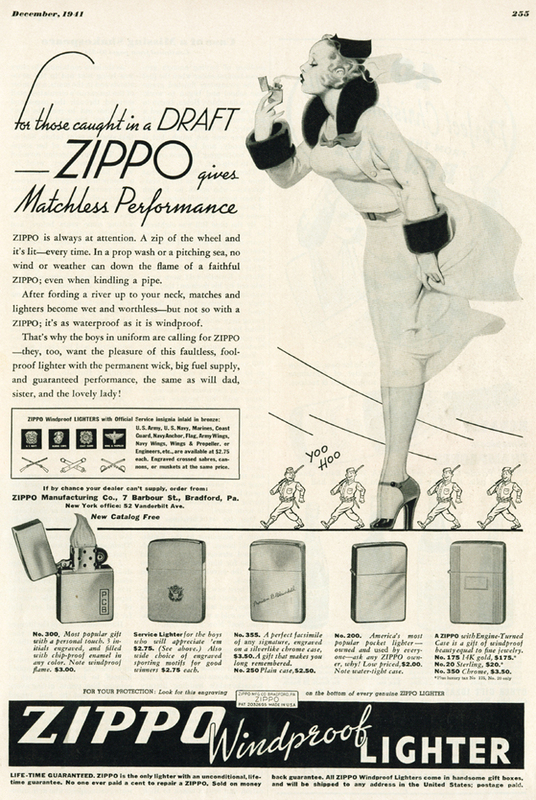 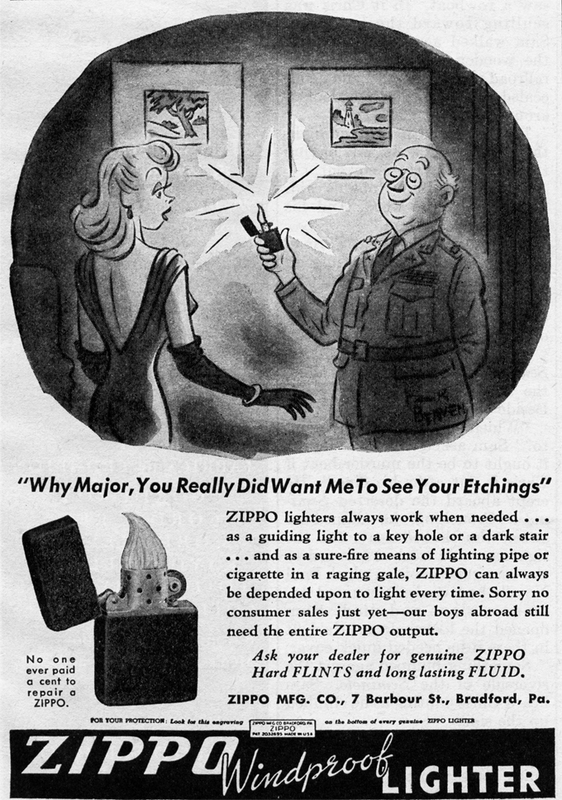 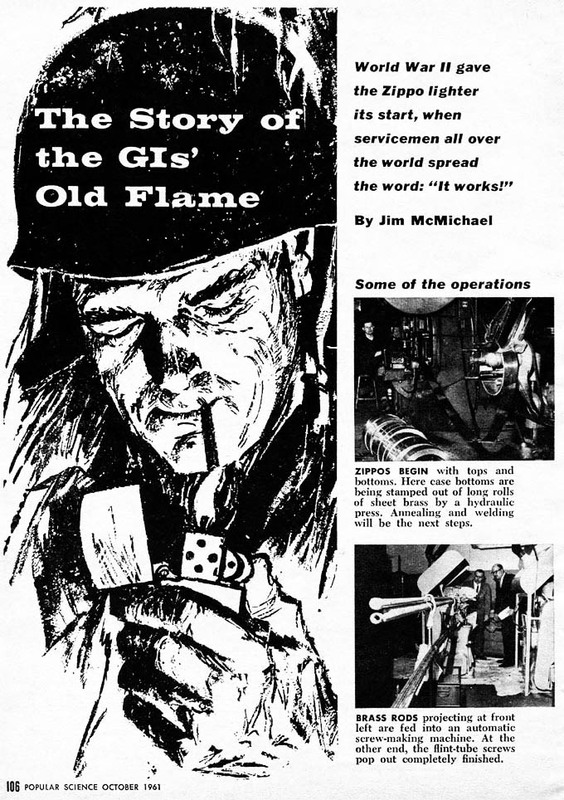 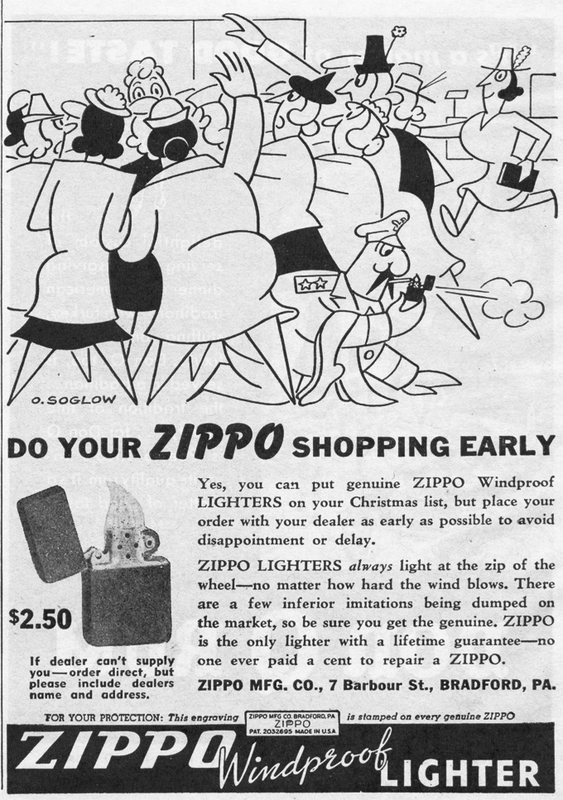 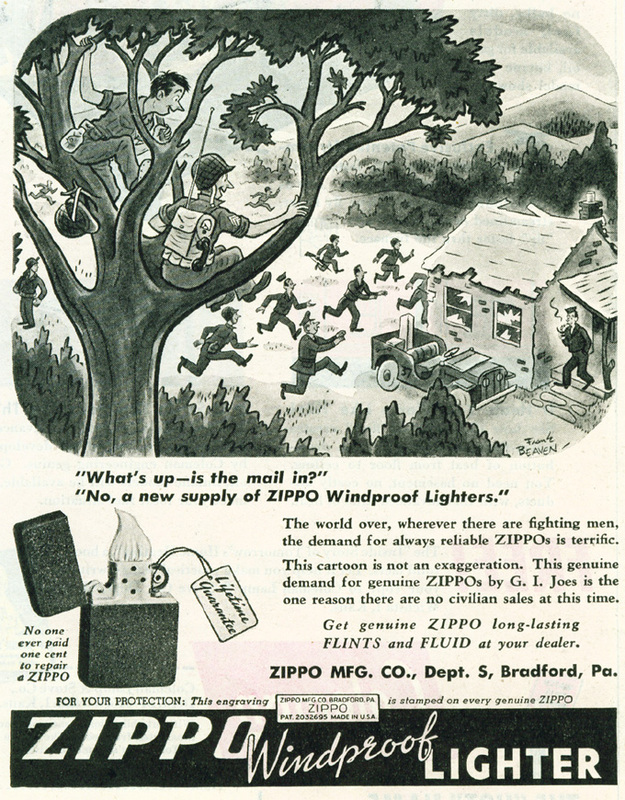 In late 1945 Zippo lighters were once again delivered to wholesalers for civilian sales. 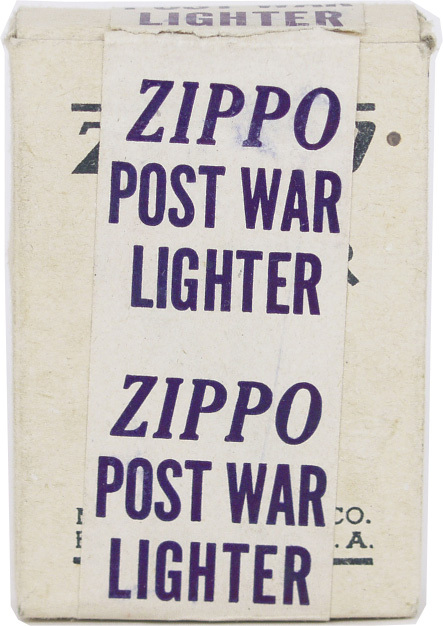 A pasted label was attached to the cardboard box saying ZIPPO POST WAR LIGHTER until late 1945 / early 1946. 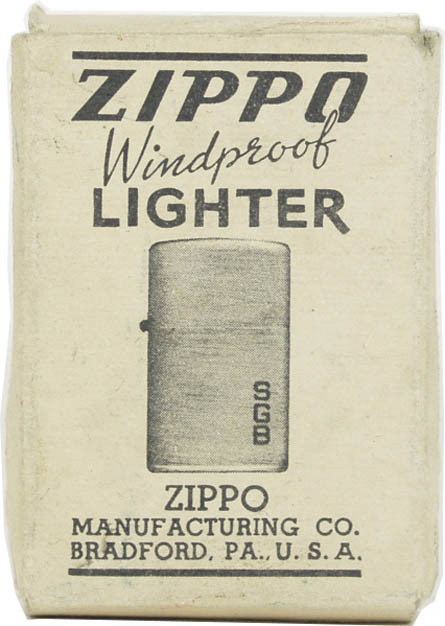 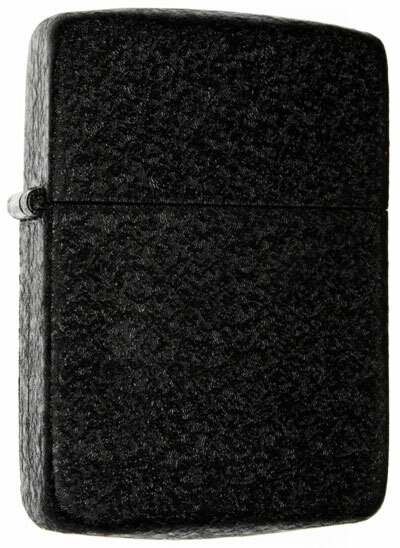 In early 1946 the box was redesigned now showing the new Nickel-Silver Zippo lighter model. 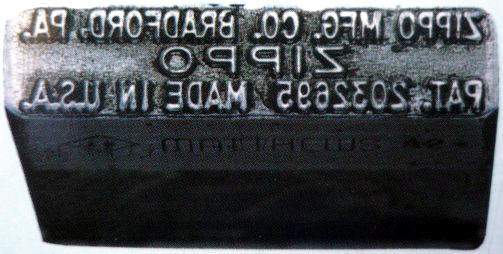 The initials SGB stand for Sarah Grant Blaisdell, Georges' mother. 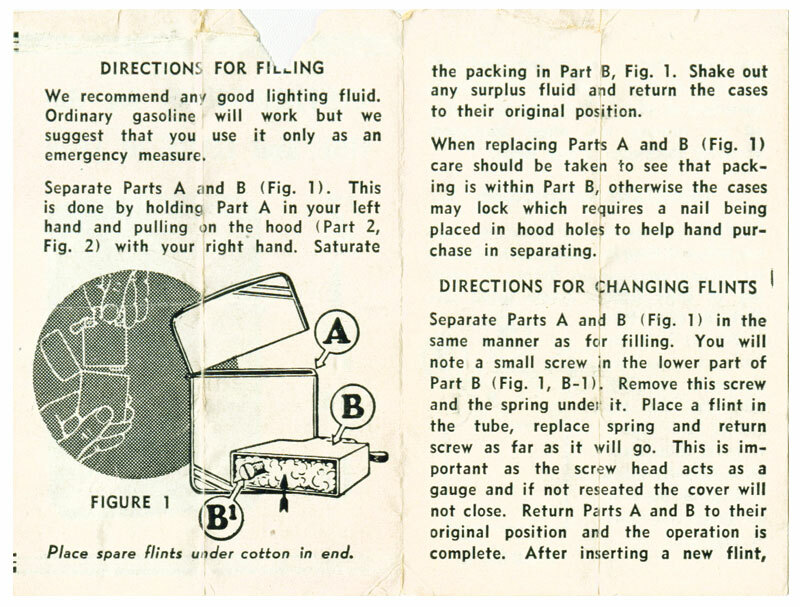 The directions for filling said: Ordinary gasoline will work but we suggest that you use it only as an emergency measure. 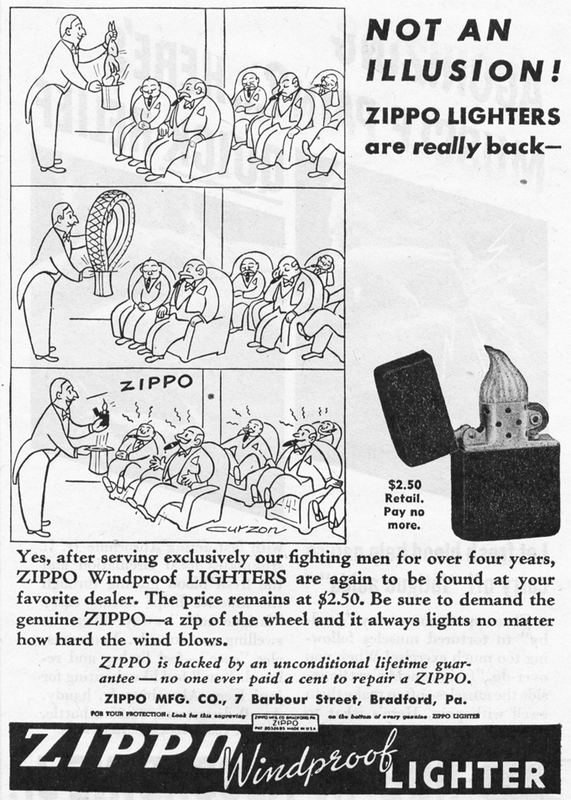 Advertisements! 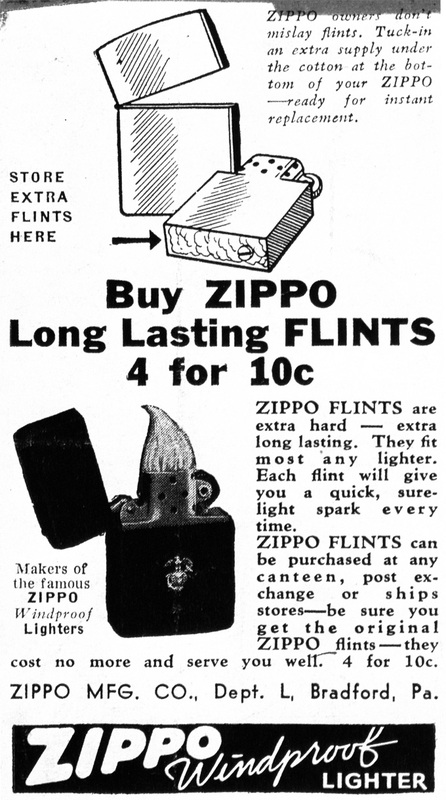 Of course newspaper ads are released in order to sell a product. 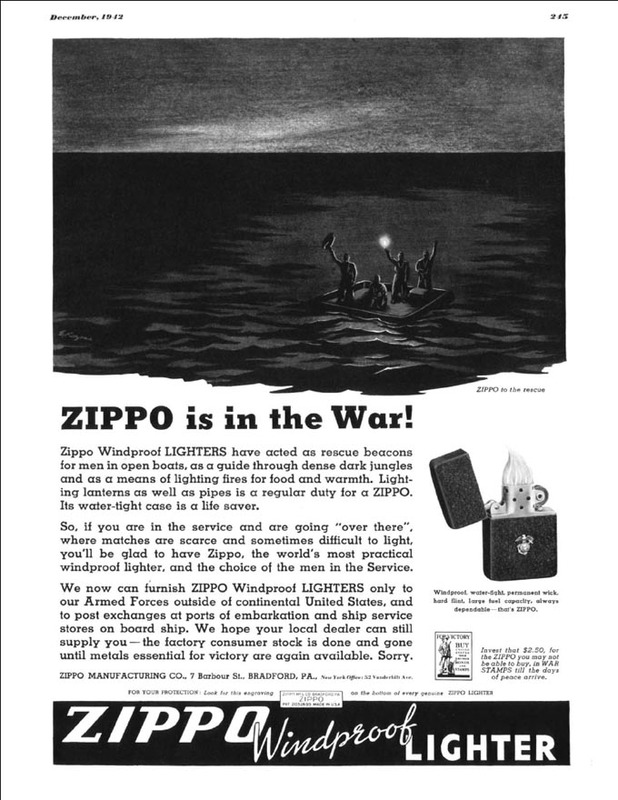 But having a closer look at vintage newspaper ads today - from a collector's point of view - all the information one can get from those is priceless. 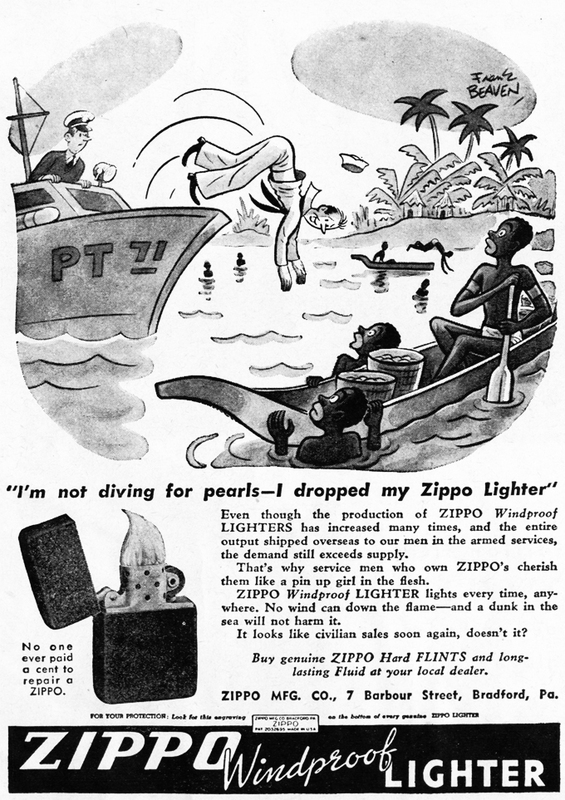 In the 1940's & 1950's ads for Zippo lighters & flints & fluid could be found in magazines such as The New Yorker, The Esquire & The Saturday Evening Post only to name a few. 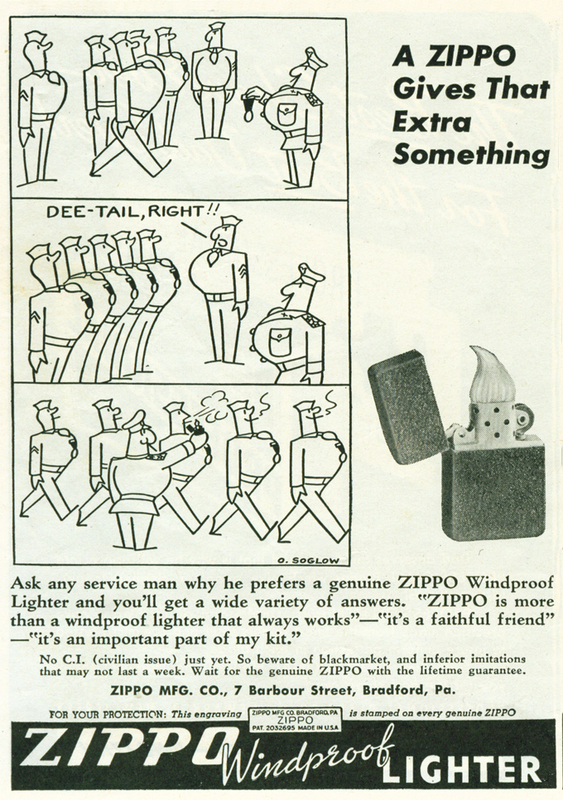 At this time it was common to have cartoon like or comic strip style ads. 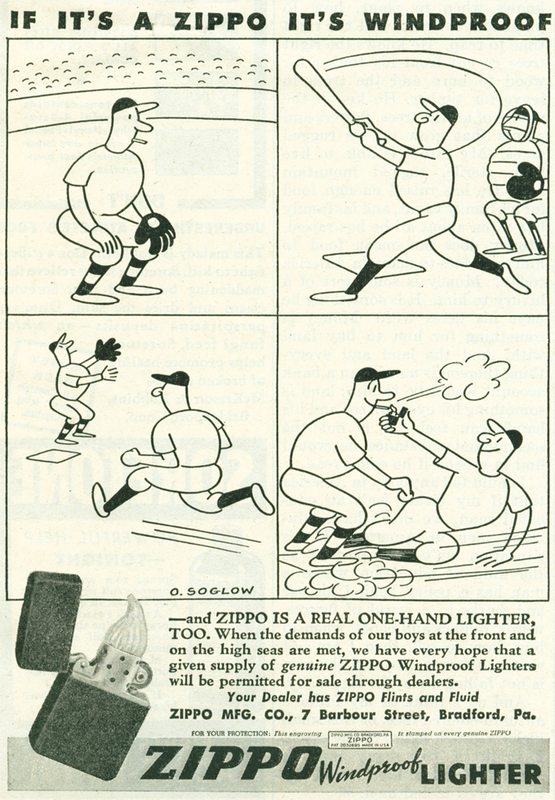 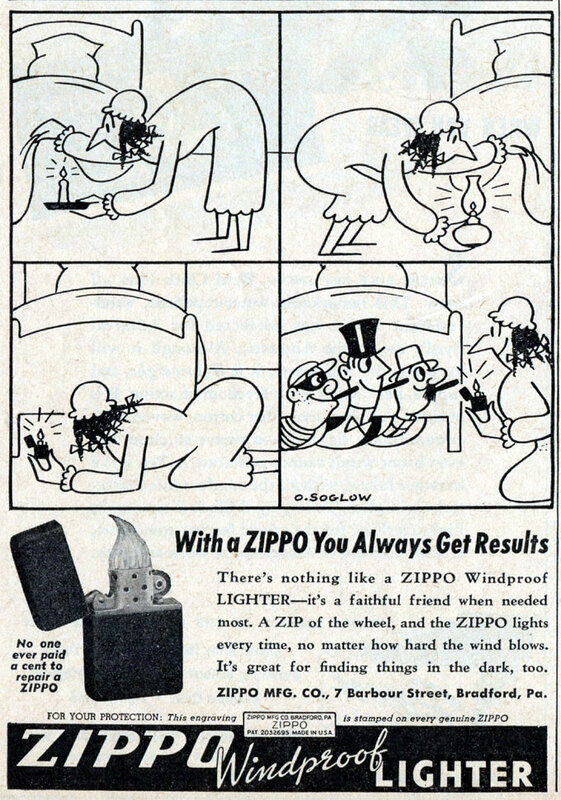 George G. Blaisdell hired famous US cartoonists like Frank Beaven, Otto Soglow & artists like John Lopker to design ads for his Zippo lighter. 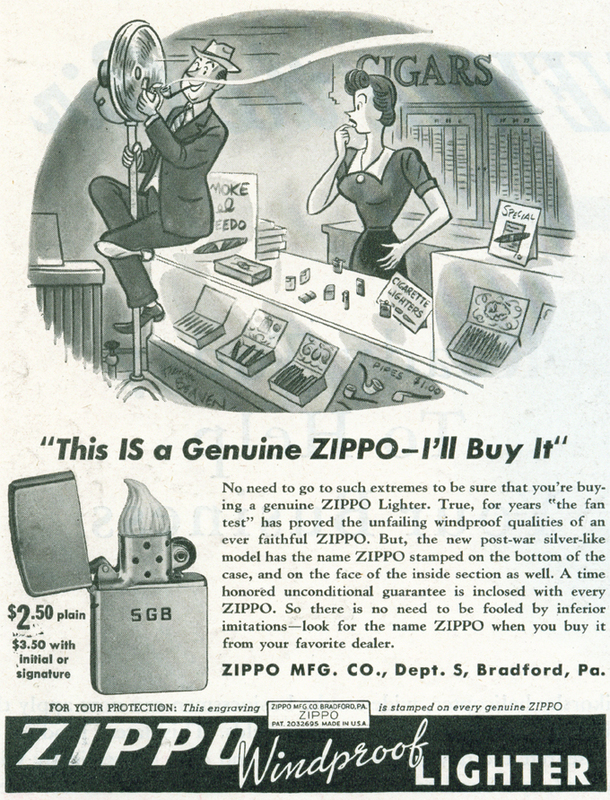 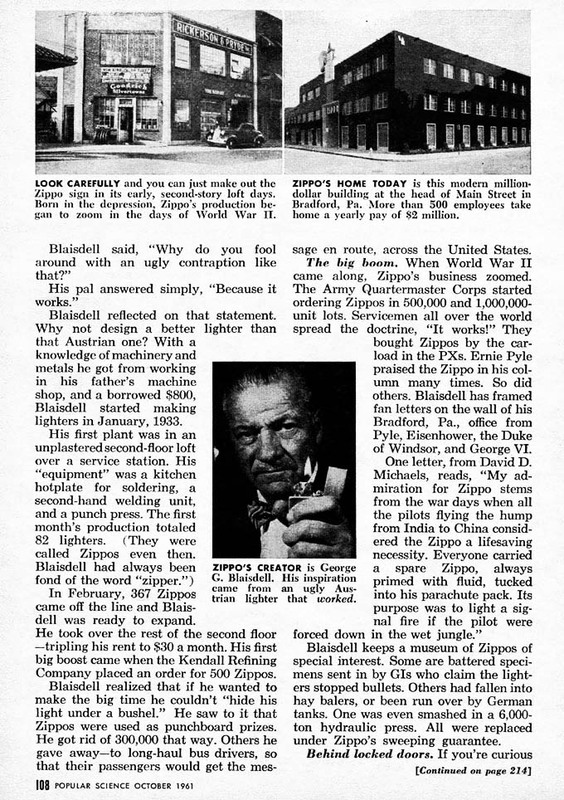 Although there were no civilian sales for almost four years, his idea was crowned with success & Zippo became famous nationwide. 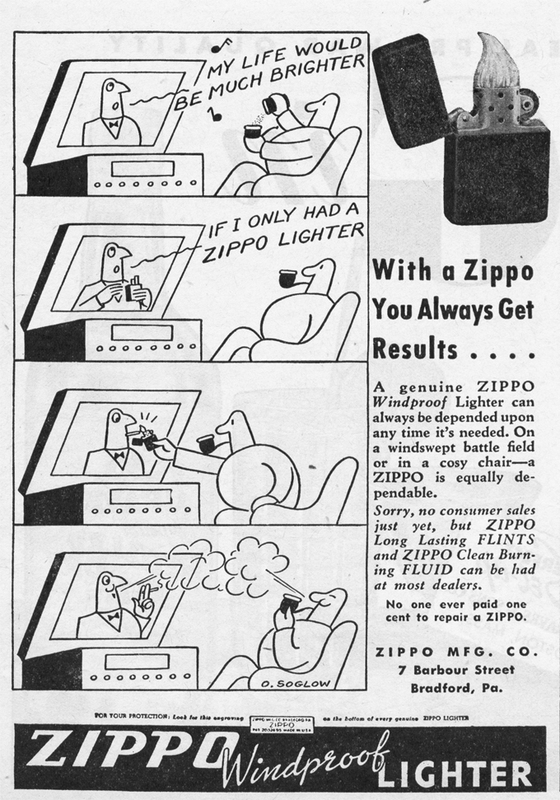 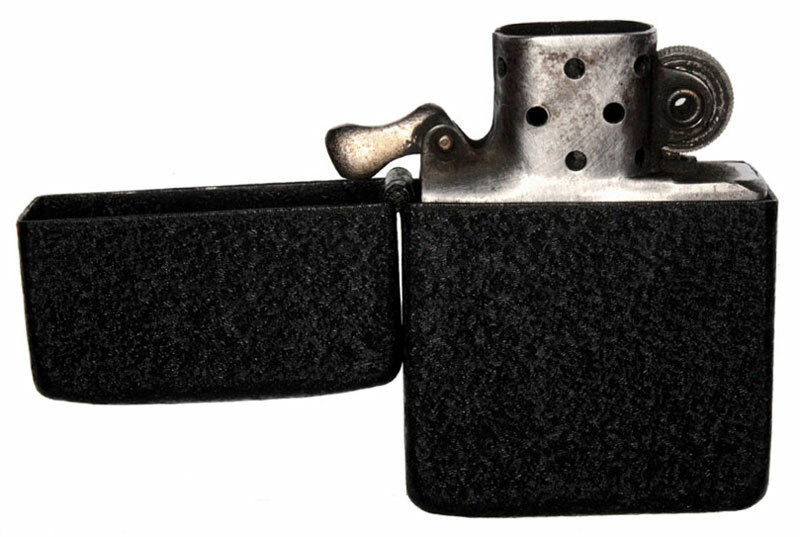 1941 was the last year square corner Zippo lighters were offered. 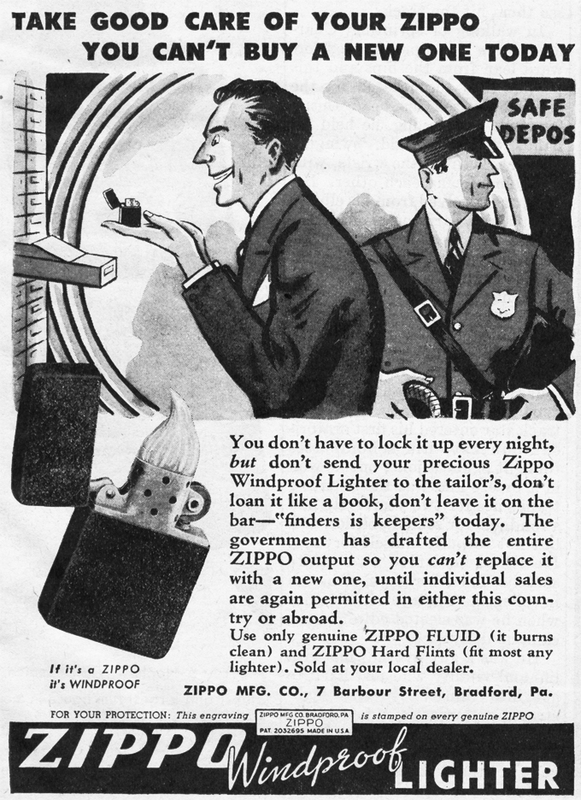 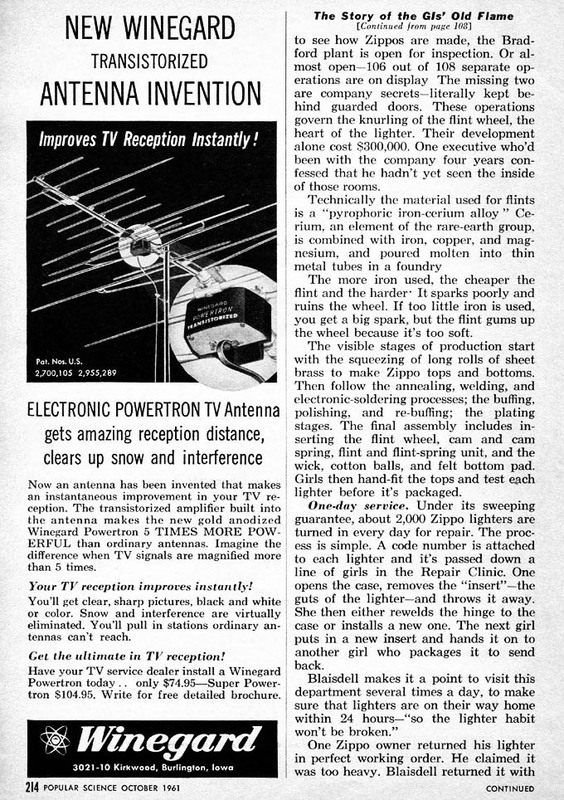 1942 ad stating for the first time "no civilian sales"
1943 ad describing a Zippo lighter as trouble proof too! 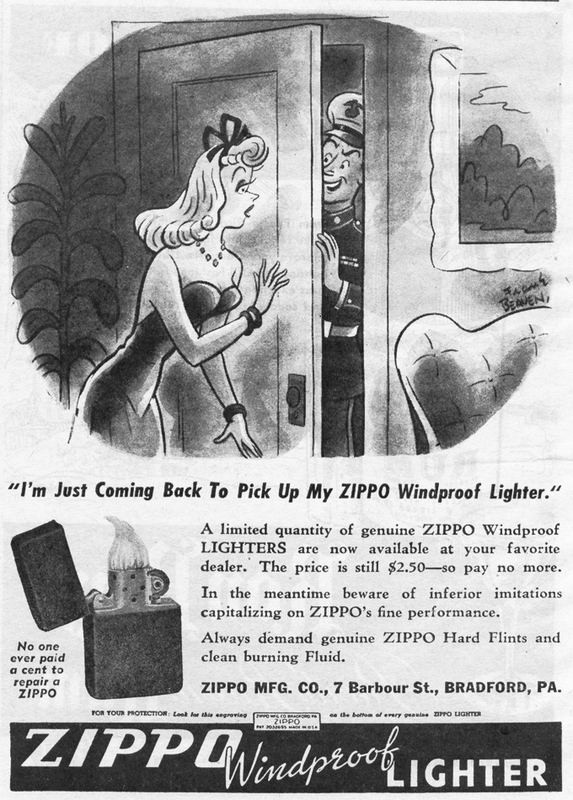 1944 ads with different head lines, saying windproof and waterproof!